Charge, store, secure and transport up to 40 devices. The Carrier 40 Cart is designed to make life easier for Chromebook, Tablet, and iPad deployments. Efficient Charging. 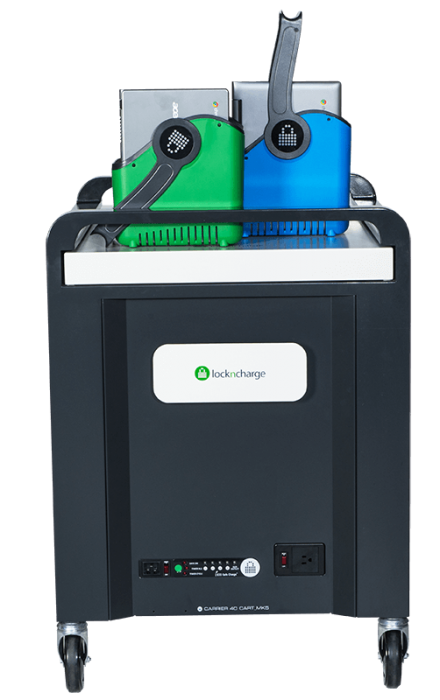 – With ECO Safe Charge, the Carrier 40 Cart charges devices safely and efficiently by staging the availability of power to each bank of devices. Additionally, a remote control is included so that the Cart can be turned on from almost anywhere. Soft closing, sliding hood. Doubling as an additional workspace, the soft closing lid can hold up to 55 lbs of additional resources when extended. The larger device storage area means that Chromebook, Tablet, or iPad devices can be accessed easier and by more users at once. Are your devices too big for the Baskets? 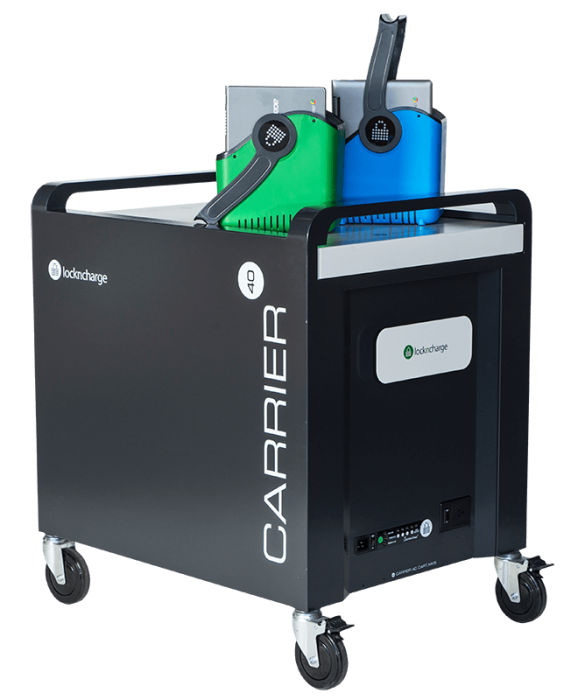 The Carrier 40 Cart features a three level adjusting storage shelf. This allows users to insert the optional device wire storage racks into Cart’s storage area (which replaces the Baskets by LocknCharge). The storage racks are designed to accommodate up to 17″ laptops. Lifetime warranty. LocknCharge products are built to last. External power outlet. With an external power outlet you can easily charge devices like a projector or other peripherals. Carry Basket Internal Dimensions. Not sure whether your device fits? Click here and download the device compatibility document. Follow the instructions to determine whether your device fits. Please note: Maximum load of 55 lbs per soft closing, sliding hood when extended.